The controllers can be stand alone or connected to auxiliary units,such as, chilled water valves, damper motors, staging relays and signal selectors to control the heating and cooling in single and multizone air conditioning systems. The Innotech ITD, ITI and ITW series of two wire current loop temperature detectors are designed to operate with the IPC package controller. 5 stage cool controller designed for use with a two wire current loop temperature detector to produce two 0-10V DC outputs and up to five relay outputs. 1 stage heat and 1 stage cool controller designed for use with a two wire current loop temperature detector to produce two 0-10V DC outputs and up to five relay outputs. 1 stage heat and 4 stage cool controller designed for use with a two wire current loop temperature detector to produce two 0-10V DC outputs and up to five relay outputs. 2 stage heat stage and 2 stage cool controller designed for use with a two wire current loop temperature detector to produce two 0-10V DC outputs and up to five relay outputs. 2 stage heat and 3 stage cool controller designed for use with a two wire current loop temperature detector to produce two 0-10V DC outputs and up to five relay outputs. 3 stage heat and 2 stage cool controller designed for use with a two wire current loop temperature detector to produce two 0-10V DC outputs and up to five relay outputs. 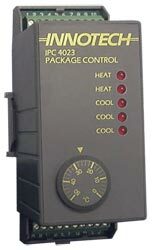 4 stage heat and 1 stage cool controller designed for use with a two wire current loop temperature detector to produce two 0-10V DC outputs and up to five relay outputs. 5 stage heat controller designed for use with a two wire current loop temperature detector to produce two 0-10V DC outputs and up to five relay outputs.